"Are you at the anchor...?" Sound familiar? Many parties establish an anchor and then have communication problems. Some feel that the best way to deal with this is to employ the use of radio, whereas others use rope tugging tricks to communicate. I'm not a fan of the use of radios, in part because people become used to them almost too quickly. When people depend on radios, they lose touch with even the most basic command sets. And when something goes wrong with the communication, it becomes incredibly hard to reestablish effective communication. Rope tugs are fine, but they should be used sparingly. It's common for climbers to miss one major factor in communication. That factor is the position of the belayer. 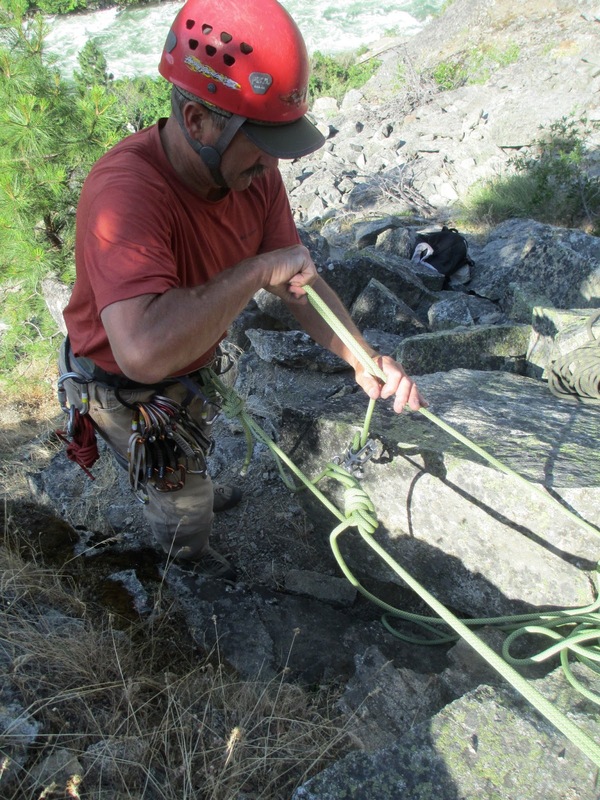 Many climbers climb up to a large belay ledge, walk across the ledge, build an anchor and then clip into it. The fact that they are away from the edge and cannot see their partner compounds all of the communication issues. The best thing that one could do in order to decrease these issues is to extend their anchor to the edge. In this first option, you belay directly off the anchor with an autoblocking device, but extend your tether so that you can look over the edge. This is a quick and dirty technique wherein you simply estimate how much rope you'll need to look over the edge and then tie yourself off into the anchor with clove-hitch. There are two issues with this system. First, it's easy to estimate incorrectly, which means that you have to walk back up to the anchor and readjust your clove-hitch. And second, your autoblocking device is out of reach, which makes it hard to provide slack or lower a climber. The advantage to this system is that it is really really quick. 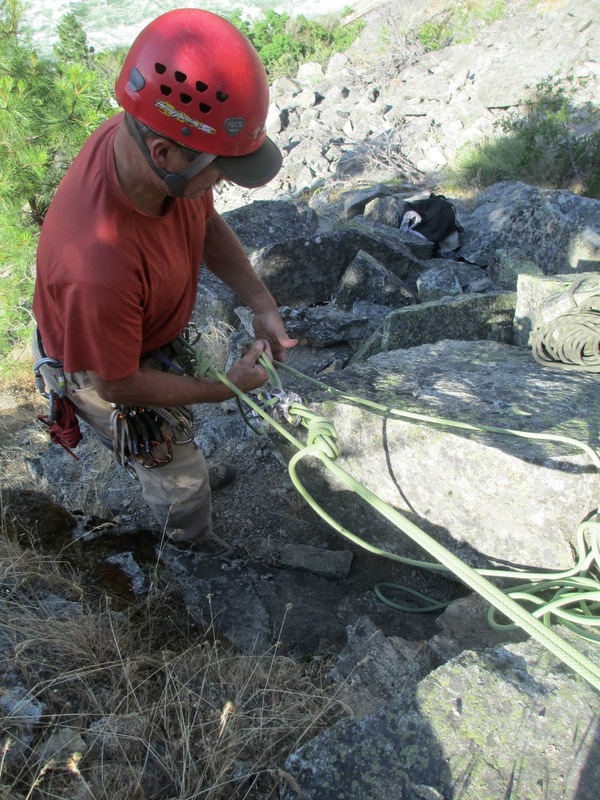 In this second system, you will clip a locking carabiner into the anchor, run the rope through it, walk back to the edge of the cliff, and then clip another locking carabiner into your harness. From there, you will clip the rope running up through the anchor to your belay loop with a clove-hitch. This allows you to set yourself exactly where you need to be. The same problems exist for this system as for the previous system. 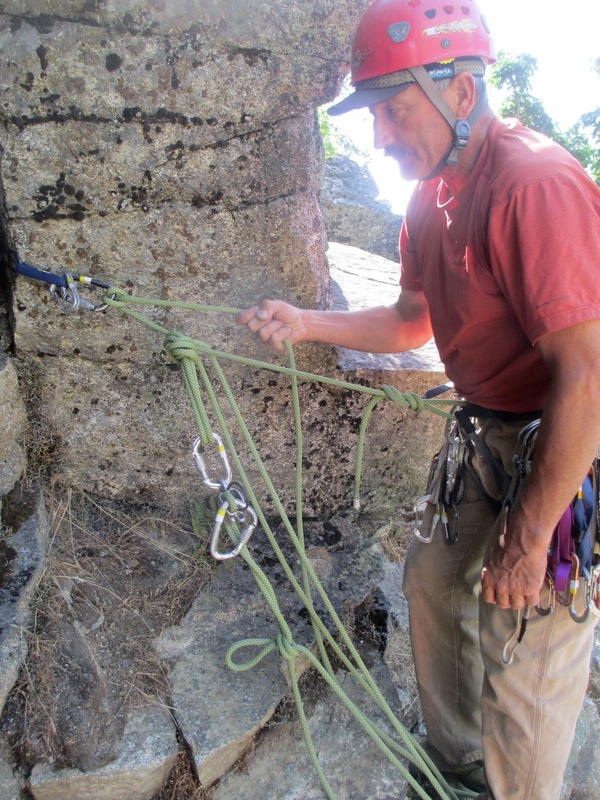 You are unable to reach the belay device in order to provide slack or lower the climber. This last system is really smooth. When you reach the anchor, clip into it with a munter hitch, then belay yourself back to your desired position. Once you are in position tie a BHK. This will lock you into place, but will also give you a powerpoint to work with. You can then belay off that powerpoint and when your partner gets up to you, you'll be able to use the munter hitch in the anchor to belay both you and your climber up to the anchor. 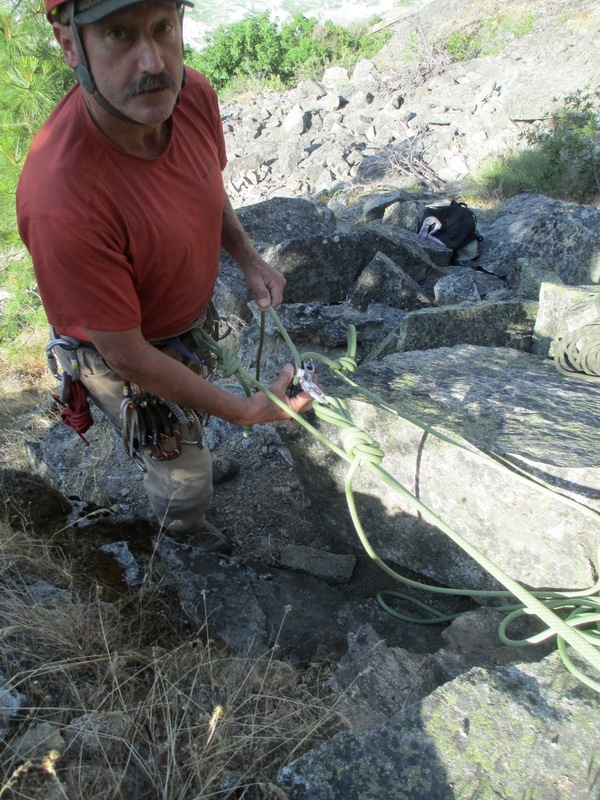 In this photo, a climber clipped into an "anchor" to lower himself to the edge. And before all of you jump down my throat, yes, it is a single cam. I was trying to teach this quickly when I took these photos. So let's pretend it's a SRENE 12 point anchor. The climber makes his way to his stance and ties a BHK, thus securing himself and creating a powerpoint. He places his autoblocking device on the new powerpoint and belays. Once his climber gets to him, he can tie a catastrophe knot behind his autoblocking device. Now he's ready to transition. He belays both himself and his climber up to the anchor. 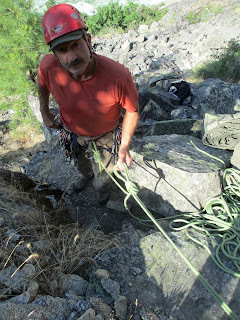 Once at the anchor, both climber and belayer can tie-in. I'll have to think about this one, but just looking at this quickly, how would you escape the system if you needed to get to your partner? Everything costs you something. This anchor would be very difficult to escape. You can do it, but it's hard. Something about your photos doesn't make sense. You show the 'BHK' knot tied with both strands of rope coming from the munter at the anchor- in other words, you take a bite between your harness and the anchor, and another bite from the strand going from the anchor to your second, to tie a master point. So far so good. But in the final step, you show the master point tied only in one strand, the one between the belayers harness and the munter hitch.This allows the other strand to be used to pull both people up to the anchor. The final photo is the only one that makes sense if you want to be able to belay both climbers up to the anchor with the munter. But it doesn't agree with the previous photos. If I'm understanding this correctly, the previous steps should include the other strand (from the munter to the second climber), tied to the belayers harness with a clove hitch, and not connected to the master point. Also, I'm not sure what the advantage of using BHK over a simple figure-8 on a bight, maybe an alpine butterfly would be. Either way, you're still tying to a single strand of rope, and the weak point is probably at the munter hitch. Why use a more complicated knot that's more of a pain to tie? You should probably go back through the photos to answer your first question. I think it's clear. I would suggest trying it on a tree to see how it all works out. As for the BHK, it's a very simple knot. It will actually be smaller than a Figure 8, though a Figure 8 would work. Jason, I scrutinized your photos repeatedly, and it is not clear to me. Looking again, the only explanation I can think of is that your setup is as I described in the first paragraph, and then in the final step, you belayed both of you up to the tree by grabbing a bite between the munter and the BHK, and using that as the brake end of the munter hitch. Is that the case? Please explain. Disregard the question about the BHK- I was thinking it was tied in only one strand, and in that situation it wouldn't make sense. If my last comment about your method is correct, then I understand why you would have to use something like that. FYI I've seen the terms 'BHK' and 'BFK' used to describe several different knots, so I think it's better to use standard or universally accepted terms. In this case, I think it would be clearer to say something like "tie an overhand with both strands"
I need to make a video about this to make it clearer. But maybe try and see if it makes sense. I'd like to suggest a variation to this technique: Instead of tying a BHK in both stands to belay from, tie a loop knot (alpine butterfly or figure-8 on a bite) in just the strand going from your harness to the munter. Attach the other strand coming from the munter to a clove hitch on a locking biner clipped to your belay loop. This way you can easily adjust your distance from the anchor at any point, and you don't have to guess how much extra rope to leave for the BHK knot. When you have lowered into your stance and you are tying your BHK, which includes your brake hand strand connecting you to the anchor, how do you keep control and prevent a fall if you slip? Is there a backup involved? "The BHK (also known as the BFK) is a double-overhand on a bight.."
- First, the knot you display here is not tied the same way as the BHK/BFK, as it is typically described for setting up top ropes etc. In every case I've seen the BHK demonstrated, it is tied in a single strand, by taking a huge bite and using that to form another bite- 'a bite of a bite'. In this case, you are taking a single bite of each strand, and tying an overhand on a bite. The result looks identical to a BHK only if you're looking at the knot in isolation, and not looking at the tails- for example the BHK leaves a bite as one of it's tails. I think this is sufficiently different that in both how it is tied, and appearance, that it is not the same knot. I suppose we could ask the Guild of Knot tyers (www.igkt.net) to settle it, but regardless, I think it would be less confusing if you referred to it as an overhand on a bite with both strands. - I believe it is incorrect to say "The BHK (also known as the BFK) is a double-overhand on a bight." The double-overhand(www.animatedknots.com/doubleoverhand) is a separate knot entirely- it's the knot commonly used as a stopper at the end of rappel ropes, and to backup a figure-8 knot (with the tail tied around the standing end). A double-overhand on a bite would have only one strand forming the loop. Out of curiousity I just tied one, and realized it's the same as a figure-9 on a bite. Perhaps a more accurate description of the BHK would be "overhand on a double bite"
This may sound nitpicky, but I think it is very important to use the correct names for knots. 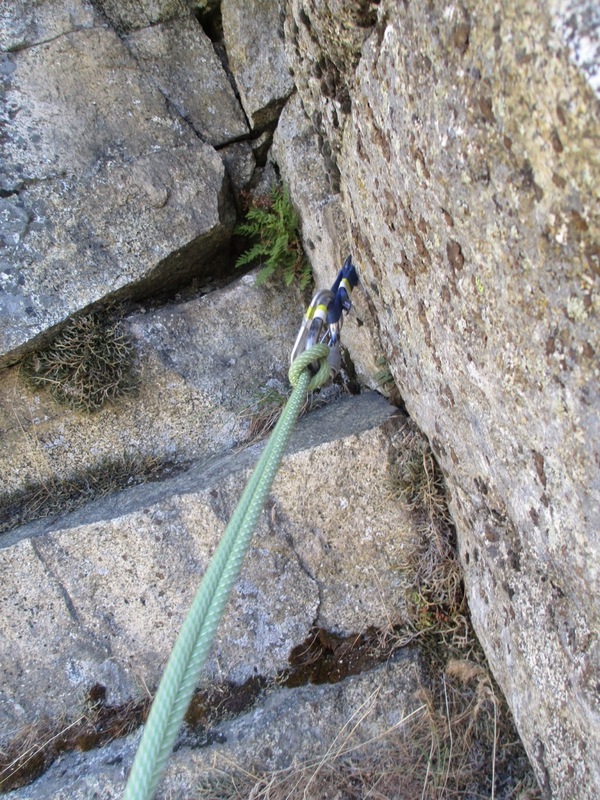 In my experience, most climbers use incorrect names for knots (such as calling a double-overhand knot a 'fisherman's'), and many often tie their knots wrong, especially the double-overhand and double-fisherman's. I've seen this often in climbers with a fair amount of experience- not veterans or guides, but certainly not newbees. I don't think this is a coincidence. Learning to tie and dress knots correctly, and call them by their proper names, makes us safer. There are several inconsistencies between knot names out there, so it's not nitpicky at all. I see where you're coming from. For example, if you look up double bowline in Freedom of the Hills and you look it up in Rock Climbing: Mastering the Basic Skills, you'll find that they are different things. I guess what I'm trying to say is that there are differences in knot terminology, but as mountain guides, we generally default to the names our guide association uses. Fair enough. I guess this is why scientists use latin instead of common names.. The closest thing we have for knots is 'ABOK #'s, but even though the Ashley Book of Knots is the most authoritative and exhaustive knot reference, there are plenty of modern specialty knots missing. I checked and there is nothing resembling the BFK. I generally try to use whatever name has historically had widespread use, and if no such name exists, I try not to use a name that has historically been used for another knot. Of course with thousands of different knots, most having multiple historical names, this is easier said than done.. But I think we should at least avoid calling knots a name if that name already applies to common knot that is in use today, especially one that would potentially be used in climbing. (Hence why mixing up the double-overhand with fisherman's knots is so egregious imo, since both are frequently used in climbing). Perhaps it would be good for the AMGA of UIAA to publish a list of official knot names, to reduce some of the confusion. If that ever happens, I strongly hope they defer to conventions on knot nomenclature, rather than just accept the most common (and often incorrect) usage among climbers..
Well explained Jason and very clear, in my opinion. Dan: I have always considered a "BHK" knot to be any knot that is tied using more than 2 strands of rope. It's a loose term. BHK stands for "Big Honkin' Knot" which is the result of using more than 2 strands of rope in any knot. It could be any number of different knots, including figure 8, overhand, or more! Jason's method is the standard, and I learned it as being called the "alpine extension." There are variations that you could make, but this is the go-to.